God Bless America Again is devoted to songs that make us proud to be Americans and songs that allow us to enjoy our spiritual roots. I’m talking about the songs you sang in church when you were growing up and songs that recall a time in America when we were free to openly express our faith without fear of ridicule-- A time that seems, on reflection, to have been filled with family, friends and faith. The series is hosted by Whispering Bill Anderson and features our Country Family Reunion artists singing and sharing stories, songs and memories of a lifetime. Artists on the series are folk like: Lee Greenwood, Bobby Bare, John Conlee, Ray Stevens, Jimmy Fortune, Jan Howard, David Ball,The Gatlin Brothers, Mark Wills, Daryle Singletary, Jim Ed Brown, The Whites and many others. All on 5 DVD’s with 6 hours of content! The price is $29.95 plus $6.95 shipping and handling. 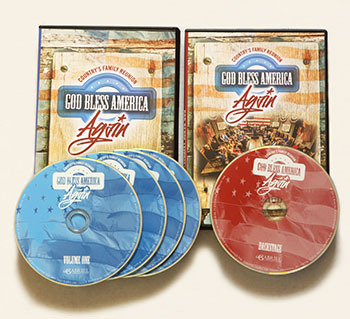 If you love country—our country and REAL country music—this is the series you have GOT to get. And, for each order made for the God Bless America Again series, we'll donate $10 to the Wounded Warrior Project, an organization that supports our men and women in the military who've been wounded protecting our great nation.